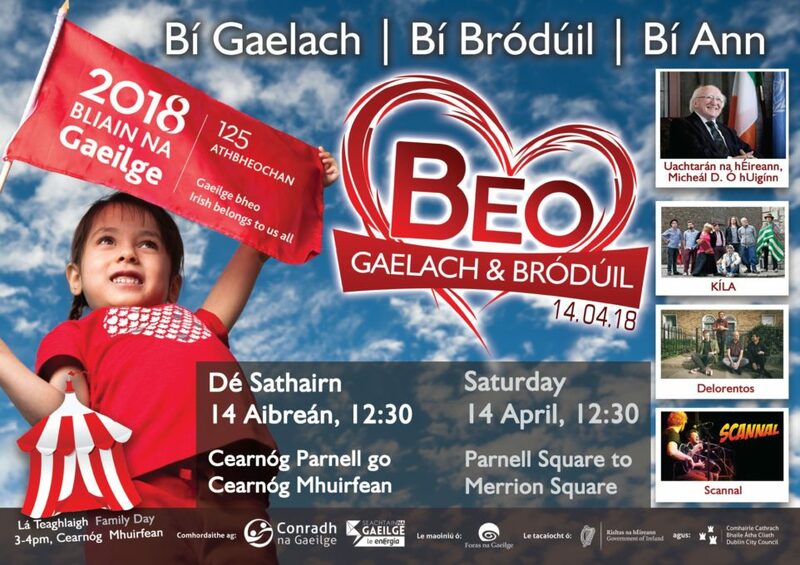 BEO; Gaelach agus Bródúil will be held on 14 April in Dublin City. Na Gaeil will come together to celebrate the Irish language and to express their pride in it. This will be a historical event, in which we will recognise the progress made by the Irish language, but to show that there is still work to be done. Over 4000 are expected to attend this march on the streets of Dublin. It gives us the opporunity to come together to celebrate our native tongue, as well as the opportunity to recognise the liveliness, community, heritage, culture, and the future of the language. It also gives us the opportunity to show the difficulties still fancing the Irish language and Gaeltacht areas today. The march will go from the north of the city to the south, where there will be a stage where music, speeches and entertainment will take place. There will be schools, Irish language and Gaeltacht groups, sports clubs like GAA clubs, other sports clubs, third level societies, community groups and families taking part. Everyone is welcome to attend! Buses and other forms of transport will be organised for those coming from outside of Dublin. To get the latest info on BEO, make sure to keep an eye on Bliain na Gaeilge social media pages, where the information will be spread as it is received. Any group, whether large or small, can register for this event. A special package will be sent out to any group that registers, which includes a blank banner, on which you’ll be asked to design and draw on to bring with you on the day. 12:00 – Meet at Parnell Square. 13:00 – Start the march across the city in the largest Irish language street festival ever. 14:00 – Arrive at the stage at Merrion Square, where the music, entertainment and speeches will begin. With music from Kíla, Scannal & Delorentos. 15:00 – The workshops and fun starts in Merrion square.